Last year I was asked by a Korean publisher to write what I would say if I were giving my “last lecture.” This was for a Korean-language anthology, in which many authors (most you would recognize) were offering their answer. For me the subject was easy–inner silence. You as an HSP understand my choice intuitively, but I will summarize my essay for you anyway. What do I mean by inner silence? Obviously it’s not outer silence. It can be noisy outside and yet you can access the quiet inside. Simply closing your eyes removes 80% of the stimulation to your brain. Instant momentary HSP downtime. I also do not mean total silence. Perhaps it would be better to say a quieter mind. Quieter and quieter, the stages of silence. But nearly complete inner silence is not out of reach entirely, as I will get to. Let’s start with a tiny bit of inner silence. I will use an analogy: Running, jogging, walking, strolling, standing still, sitting, lying down. Now apply it to your mind. You’ve lost something. You are searching frantically, your mind racing. You feel stressed. Then you give up. Later, when your mind has gone from running to jogging, you remember where the thing is. Or you wisely sit down to think about where you last saw it, and in that quieter state you remember. Maybe you can’t remember a name, try as you may, but later when you’re quiet–by my analogy you would be standing not running–it comes to mind. Maybe you’re trying to solve a problem, but when you’re more relaxed, “sitting,” you find the solution. You are doing something creative, then quit, feeling tired. You “lie down,” figuratively and literally, so that in the middle of the night, your mind relatively still, you have a creative insight. Many creative people report their best ideas coming in the night, in dreams even, or when they are just taking time off away from their work. Let’s go deeper. If everyone at their work or at school sat down, closed their eyes, and were silent for 10 minutes each day, whatever they did in that silence, you can probably imagine the good effect. Deeper still, many find silent prayer or contemplation extremely useful. And there is meditation, the route I have used for 46 years. I chose Transcendental Meditation, partly because its goal is the deepest possible rest and inner silence (well beyond “thinking a mantra”). Any meditation, however, or any deliberate method of turning inwards to find that deeper quiet, has its degrees. How deep I go in meditation depends on how busy or stressful my outer life has been that day. Any amount deeper helps quiet the mind, so I believe all of my meditations are “good.” But they do vary. Suppose I rated my meditations from 1, very deep, to 10, rather shallow because of a high level of stress during the day resulting in many thoughts and feelings, or distracting stimulation nearby. At home, at peace already, I might go from 3 to 1. Very nice. But in a way, when I’m stressed, going from 10 to 7 feels more valuable. For example, I recall meditating as best I could while standing in a crowded subway car after it had stopped mid-station and the lights had gone out. Or meditating in a hot airplane stuck on the tarmac for two hours. As time passed in both of these situations, people became anxious or angry. To help me stay calm, I meditated, again moving me only from 10 to maybe 9 on the inner silence scale, especially the time I was standing in the subway! But I could tell that this “9” remarkably helped not only me but those near me as well. Maybe this is over generalizing, but think of how much better the world would be if HSPs regularly did whatever they chose to do to instill inner silence into the atmosphere. There’s nothing new about this. In every time and tradition, people have entered inner silence for the purpose of helping the world as well as themselves. Sometimes people choose a life style of inner quiet, as in a monastery. Or they seriously devote a healthy portion of their life to cultivating inner silence, even while also engaged in the world. It is quite possible to do. Indeed, the time spent often is made up for by feeling fresh, tranquil, and efficient when you do work. Whatever the tradition, those committed to these deeper levels of inner silence and calm report at its deepest the same satisfying state (I could supply you with dozens of quotes), perhaps best called “pure consciousness” because it can be without thoughts, feelings, or perceptions. Yet you are wide awake inside. Some experience it as a “brilliant darkness” or the “palace of nowhere.” Although one can reduce the experience to a mere pattern of brain activation (and a very useful one), those who experience it repeatedly associate it with various ultimates beyond description, such as God, Allah, Brahman, the Absolute, or the Ground of Being. A friend of mine and comparative religion scholar, Robert Forman, likens the universality of this experience to astronauts taking off in different rockets from all over the world, and once they reach outer space, they all experience weightlessness. However they describe weightlessness, same state. In the case of pure consciousness, these inner explorers also seem to find the same state. “I can’t imagine my mind completely stopping.” That’s fine. This deep inner silence is not always without thoughts. It may feel more like a background to thinking, a silent background that moves to the foreground as you go deeper, or it feels like a screen on which life’s mental stuff happens, but soon the screen itself becomes more interesting, more charming. Think of offering the “monkey mind” a banana and it settles down. It may wiggle a bit, but basically it is in bliss. The mind loves those deep states, even if tossed out at times by the stresses of your day. That’s why I, at least, have had no trouble meditating twice a day for almost half a century. You do not have to be a mystic to reach this state. Several forms of meditation can bring you to very deep silence, especially with daily practice. I guess I’m trying to say that it’s natural and easy, your birthright so to speak. You have probably stumbled upon deep inner silence before, maybe first in childhood, out under a tree. It is so natural that if you begin a practice and are regular, this deep silence should be experienced to some degree in days or weeks, not years. If a daily practice (time in nature, yoga, prayer, concentration, contemplation) does not take you there, you might consider adding some time with a practice that does (without necessarily discarding the other, which may have other significant value for you). Finally, as you develop that inner silence, you might effortlessly turn your attention to it during your day. Often it is surprisingly easy to find and enjoy it anywhere you are. It does not interrupt what you are doing because it has no content. You go on more or less as always, but the overall state of the brain feels different. As the frequency of this awareness increases, it is my experience (and many others’) that one finds a kind of calm satisfaction with life. Things go easier and easier in various areas of your life, almost magically. Life is not perfect. It is still possible to suffer in some sense, but there is also something at the same time, well, satisfying about life. I have described this deeper state and its integration with life so thoroughly because I suspect that most HSPs were born seekers, whether conscious of it (yet) or not. While I don’t want to tell you what path or what goal you should seek, I do not want to leave you completely alone with your inner seeker, either. So perhaps this discussion will stir something. Or simply inspire you to find more efficient downtime! More rest in less time! Finally, I know we are all worried about a great many things happening in the world, but I think you would agree that some inner quiet would help. After all, being crippled with despair about the state of things does not help. In contrast, inner silence brings some calm. It helps us to see the big picture, gain some equanimity. Bottom line: The deeper and more frequently we HSPs go inside, the more we nourish everyone and everything around us, including of course ourselves. I wrote the original “last lecture” because I find most people do not know about this inner silence or the possibility of integrating it with daily life. This seems like a terribly unfortunate lack of basic knowledge about a remarkable human capacity. Imagine most humans not knowing they can learn to swim. Strange, yes? Since we HSPs are the pearl divers of humanity, we need to teach them at least to dog paddle! Although I read it a few years ago, lent it to a friend and she lost it – I want to thank you for writing your book. It has given me a lot of insight into my thoughts, behaviours and odd inclinations. There was a time in my life that I thought I was autistic or mentally challenged because I would get so overwhelmed and stimulated, that I would shut down and the resultant apathy would lead to a cyclic depression. I had to take antidepressants, mood stabilisers and sedatives to help me cope. Your book awakened my inner strength and empowered me to learn how to ground myself, to decompress my overstimulated self and to clear the water of my busy muddied mind. I’m an ENFJ, English literature student who will pursue my PhD in English on the same subject, Sylvia Plath’s poetry, in the near future. I am also a HSP and I have learnt to become proud of my gifts, and to manage them when they become curses. Thank you. Sarah I love that you share a bit about your life, including the Myers Briggs. I am an INFP (and HSP) and it surprised me (in a delightful way) that an ENFJ is pursuing a study of poetry. Yay for the doorway of your words. Dear Sarah, I am an ENFJ HSP as well and felt very moved by your comment. You are starting a PhD soon? This is so exciting. It is quite a challenge, but I think you are already ahead of the game. Poetry is essential. Good luck! I long for the peace of inner quiet. I have always noticed a difference in myself in feeling and reaction to the world compared to others. I now know it is simply a high level of empathy and I am more compassionate towards myself and especially others knowing they do not feel what I feel. My whole life has been a barrage of comments with unfortunate labels such as high maintenence, too sensitive, crybaby, woe is me person, or especially painful, “crazy.” I have tried everything, depression medication, Buddhism, Cherokee spirituality, Christianity, drugs, alcohol, losing myself in others, ( I have 2 divorces in my past, I am married to a wonderful man though he often thinks me crazy), and isolation. I am a musician, wife, mother, and teacher. In many ways fufilled, but often depressed and lost. Thank you for this site. I am inspired to accept myself with the hope that others are working to make the way I am not a freak gene or a disorder, but simply another expression of the beauty possible in being human…to love unconditionally all people. I meant to type possibility! Hi Laura,depresssion is a form of physical shutdown, to cut overwhelm. It can also be a state where our unconscious mind is in conflict trying to solve a problem and the conflict has paralysed the mind. That is where psychodynamic therapy with bodywork (trauma will not process without bodywork accompanying the words of therapy Ref, Bessel Van de Kolk “The Body Keeps the Score”). There is a scale of Central Nervous System Stimulation the lowest is depressed, ie understimulated, then normal ie socially open and both alert and calm, them overwhelm, them trauma where one is so overstimulated one is in the panic of fight flight. The novelist Sara Maitland has chosen a life of actual silence, living alone on a remote moor.She writes about this beautifully, incorporating the history of retreats and hermits in “A Book of Silence” and “How to be Alone”. There are also lectures and talks by her on YouTube. I believe a degree of external silence is important for HSPs to find their inner silence. Although I myself found careers that required HSP if you like, an arts producer for the media and then a child psychotherapist, I moved out of a city myself. I had no choice I could not tolerate the overstimulation anymore. Seeking silence had been a an unnamed quest until at last encountering it in contemplative traditions, most powerfully in Zen Buddhism. My life and psychotherapy practice are girded by this silence, and your pioneering work allowed me to grow personally and professionally, forming a specialty in working with HSP’s. May you feel a swell of resounding gratitude from us HSPs for having bestowed not only validation but also tools for navigating relationships, parenting and our noisy world. Your assurance in this blog that the mind needn’t be still in order for deep silence to be experienced will help those who’ve thought that a quiet mind is a requisite feature of mindfulness or meditation. Not true at all, is it? Having spent thousands of hours immersed in that silence, it is now available to my awareness throughout the busiest of days. Palms together and a deep bow to you. Thank you, Elaine, for sharing your essay on inner silence. Silence has been a theme for me throughout my life. The memories of my childhood and adolescence that really stand out are ones of inner silence. Golden memories. In every scenario I presently recall, nature’s elements are the access points to silence — rich green grass, sunlight streaming across, opening buds of trees, gentle winds caressing, mountains cutting into blue and stormy skies, glistening and crashing waters, … birdsong. During my adolescent & adult life I was more disquieted than anything else. Being at the far end of the HSP spectrum, in terms of receiving understanding, though my familial home was not uncommon its impact was profound. I came to deeply despise myself, to a dangerous degree. Being around people became increasingly difficult. Sitting in nature was my retreat. I remember as an adult with young children. While my husband was away on business, I left the kids briefly with their eldest brother to pick up a few groceries. The path to the grocery store was along a creek. Inside, thoughts raged. I felt like some terrible beast was tearing me apart from the inside out. Somehow, in spite of the raging within, the wind in the willows and the trickling water were able to penetrate, to speak into me. I could feel this gentle calm reach in, and I felt a slight response of the same. The words came to me in this moment, a “silent conversation”. I attempted to describe this “silent conversation” to others, but they didn’t seem to get it. Regardless, from that point on, for me, a longing developed for this … Silent Conversation. Elaine, Thank you for your all your work for HSPs and Suzanne, thank you for your comment. Most children and adults in our modern, (i.e. insane,) lifestyle, are suffering from a nature-deficit (disorder). Nature is my sanctuary. I have symptoms of multiple chemical sensitivity (MCS) and electrical hyper-sensitivity (EHS). sometimes called environmental illness (EI). Earthing, literally getting grounded, by connecting my body physically to Mother Earth, regularly, is vital to my physical health. I don’t see my sensitivities as a problem, although they can cause inconvenience. I see myself as a canary in the coal mine of our increasingly-toxic world. My acute sensitivity is a gift; extreme awareness of ‘energies’ which others are oblivious too. My purpose is how to become an effective messenger, not an overwhelmed canary. Ellie, Susan, Elaine and all the other HSPs, wow, thank you for sharing your words and experience. I am just learning about all of this and I certainly feel I’ve stumbled into the right place. I so relate. I am home. As an HSP INFP straight male raised in the South, I had many occasions of seeking silence, being called too sensitive and not knowing why. As a young adult, I experienced my first encounter of silence by closing my eyes, sitting still, and letting things flow. That experience changed everything for me. Some years later I discovered my Jungian type and that I am a highly sensitive person. I write this to encourage men, especially who were raised in the South who may be like me (unaware of themselves and their sensitivity) to embrace it and explore your sensitivity. Thank you, Elaine for addressing this need for ‘stillness’. I often tell my family I need my ‘Sandi time’. For many many years I felt there was something wrong with me that I had to pull away from activity and the noise that was basically ‘daily’ in our home of five siblings , all a year a part in age. I suffered from chronic headaches, (still do) and was often fending off remarks of ‘too sensitive’, ‘wet paper’, carrying my heart on my sleeve, etc, etc. I didn’t seem to fit in. As an adult, i went the route of antidepressants, years of talk therapy, biofeedback, all the while trying to be a strong role model to my two daughters. Yet, the only time I felt at peace with myself was when I was doing my artwork or sitting on the dock alone at the lake, allowing just watching the waves still my being before facing the day. with what is life” yet, he accepts that about me. When he senses I am becoming distressed or overwhelmed with a situation in our life he will often say, “You need to go paint or go work in the garden.” If there is a crowd function coming up on the calendar, he will often say, “I would like you to go with me, but if you feel you can’t ….you can’t.”I feel fortunate that he recognizes my need for that personal space of ‘quiet time’ that I require to rejuvenate, and that while I can be quite sociable, often times large groups are just overwhelming to me. With being still, I don’t always have to be in a meditative state, though I try to for a short time each morning. If while sitting quietly, I can not only experience the steady breaths of my lungs, but also actually feel the bond of connection between myself and my Goldens as I stroke their fur and with eyes closed sense our breaths become as one. As my strokes of paint connect with my canvas, and a visual appears, I am lost from my surroundings and immersed in where that visual takes me. My ability to sit outside and focus on the different sounds of the birds in the Nature Preserve behind our home, is so uplifting. It amazes me how these experiences can change my depressive state of mind to one of joy and lightness. When I read your book and viewed the video, it was so comforting to find there wasn’t something wrong with me, but rather something very right with me that not many people are fortunate to experience in life. I will be forever grateful to my therapist that introduced me to your work, and to you for giving of yourself to make me feel okay about being an HSP! Thank you for reminding HSPs (and people in general) of the power of going into silence. I am inspired by your thoughts to take up some kind of daily practice. I am HSP. My family can see this only as a weakness. I cry at moments when they get mad. I talk when they shut out. My kindness and empathy results in being treated like a doormat. My boundaries are ignored. My boundaries appear weak. I’m tired of accommodating and stretching to understand. When I’m simply labelled as too sensitive or taking things personal. Work is more of the same. I look forward to video on Sensitive AND in LOVE. I understand this. My family is insensitive too. I’m 46 and have just, after 25 years of seeking help to figure out what was wrong with me, have received treatment for complex PTSD because of being highly sensitive in a highly insensitive family. Rest assured, if you can find the right kind of empathetic, kind, understanding ppl, rich and rewarding friendships are entirely possible, where doormats are colourful things you put down to welcome kind souls into your life. For me, I needed EMDR therapy to release a ton of stress that was trapped all throughout my body. Then I found out about the HSP. Now I’m starting to understand and really feel that there’s nothing wrong with me at all. They just didn’t get it. Thank you so much for commenting. I am 10 years older and just learning about HSP for the first time in 25 years with depression and was feeling suicidal. I think I just found the missing piece to my puzzle. It is so unbelievable that an acronym could change my whole life. For me to understand all my unique HSP qualities, dispositions and feelings. I was scheduled for ECT and did not feel good about it but when your mind has gone dark and there is no light…well, you can’t un-ring that bell. I know ECT has worked in situations like this and saved people. I can always go back to it. I cannot learn quick enough. Tools to help me heal and be the best and healthiest I can. Thanks for yor share. 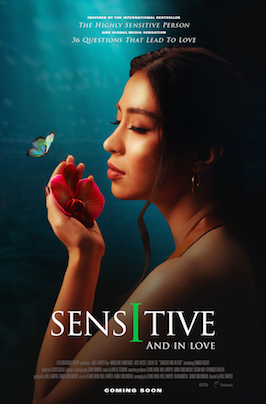 Do any of you find that you are sensitive not only to what you perceive—as in “sensory-processing sensitivity”—but also to your own cognition? I strongly suspect that much cognition that is subconscious for most people is conscious for me. I’m not sure if that has to do with being sensory-processing sensitive, or if it’s something else, although they certainly seem related. It makes inner-quiet a much more difficult state to achieve. The only time I’ve experienced it is when I was once under the influence of Xanax. I think I understand what you’re explaining here, although all of us have different lived experiences. I also find it extremely difficult to reach complete inner-silence. For the past few weeks I’ve been meditating regularly and here’s what happened to me: in the beginning, I would find inner-silence for a maximum of about 20 seconds during a 5-minute meditation. At the moment, it’s up to about a third to a half during a 5-minute meditation. To other people, 2 or 3 minutes of inner silence might seem negligible. Given where I started, I think it’s wonderful. I try and do a few 5-minute meditations during the day and not all in one go – that also helps me. Inner silence, yes indeed! What a rare gem in today’s busy world. Late night thinking? Oh no – I wont get sleep. My brain has a mind of its own, and I have a hard time keeping up with it. Your writing in this blog, reminds me of a favorite science writer, K.C. Cole. She helped intrigue me in a subject: nonlinear dynamics. One topic of that describes the magnification of nested layers of the famous Lorenz Butterfly type graphs. My Higher Power sometimes takes me on a journey, descending ever deeper into these nested layers of simplicity, quietness, and openness to Him. It takes practice, and when life gets riled up, it is easy to lose the ability to do it. But the purpose is practice, anyways, not necessarily reaching goals. (Must remind myself of that, often.) With heavy stress in life, my Higher Power carefully opens me up – not like a flower, but like an onion, peeling back the thick, stiff layers of stinky stress. Thank you for your work, it has answered roughly half of my concerns. Thank you for suggesting to research about malignant narcissists – it answered the other half of my concerns (I strongly recommend it to HSP’s in very difficult relationships). I can really relate and agree with your description of Inner- Silence. I am super sensitive and I have learned through a lot of pain how to protect myself through meditation and visualization. Since then I have met people like me and I am just beginning to appreciate my sensitivity as a gift. I am an artist and I have created paintings my whole life starting in middle school in the 1970’s and I was always striving and struggling to find subject matter which fit me or pinpointed what other people would like to view. I could not stick to one thing and it was nerve-racking and frustrating. In 2013 a friend took a REIKI Class and asked if she could practice on me. When she started I began to see clouds of color behind my closed eyelids and I told her this. It was amazing and didn’t stop there. I learned I could hold the hands of people and see things with my eyes closed and I began to paint what I saw. My friends encouraged me to go to wellness spirit fairs and do this, painting it for people. I cannot begin to describe the incredible journey this has taken me on. The things I paint for complete strangers is very personal and sometimes it is an image which relates to secrets they have never told anyone. I was my own worst critic in the beginning and I can no longer deny the depth I feel when I am painting for another person. It is as though I am learning a new language best described as,” Audio Feelings.” feelings speaking through art. This gift taught me the very very subtle differences between my own feelings and theirs. It explained my deep desires to be alone and away from people even though I love people and being a part of a group. It explained physical pains I endured just walking into a hospital or nursing home. I didn’t know what I had been feeling was not my pain. I am just beginning to go out and lecture about this in hopes of helping other sensitive people understand themselves. 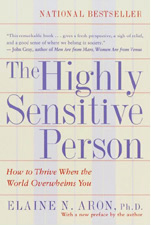 My sister just told me she is reading your book, The Highly Sensitive Person. and I looked it up on the internet which lead me to here. I will be reading it and I am very happy to have found this web site. Wow. What a story. So you “feel” other people’s pain? So interesting. And the “audio feelings” are interesting too. I am a HSP, but do not physically feel other’s pain. However, I am acutely aware of something when I enter a hospital, or rehab center. I can immediately sense something…makes me uncomfortable. I can pick up on how people feel instantly, and sense immediately if someone is “like us” or not. I struggle with wanting to be alone, and being OK with being alone, and also feeling extremely lonely at times. Not sure how to solve that one! Thanks! Love what you said about sensing others pain,it’s called body impressions.at times if I know who it is I’ll ask to pray for them and helps them and me.Once I felt ill phoned a friend for prayer and she said please pray I’m ill.I prayed and didn’t feel sick it was her feeling sick.It is a gift although when you can’t tune into who it is feels very uncomfortable.still learning how my hp intends to use this. Lovely Elaine. I relate to what you say as am myself a long time meditator. Similar to you I use a traditional mantra meditation and have been meditating for over 30 years now. A pen-friend in Oregon pointed me to your website which is very interesting as well as useful. Best wishes to you and thanks for the website. I look forward to reading through the literature you have developed and learning to see this as a gift, versus a curse. Ah yes, thank you for affirming the notion of HSP seeker, as this has been coming up for me too. Seeker of what?…hmm. Clairty, peace of mind, love, light, pure consciousness, universal truth, origin of the cosmos, telekinetic powers & more? Just wondering. I guess when I think seeker I think mystic-like (which could/could not mean lots of things). I do believe that HSP have to build themselves a strong lens to harness all the light shining through them. This is a wonderful site for people who can sometimes prefer to be alone to not feel so alone in the world. As well, to make ok the generally held Western stigma of being a “sensitive person”. Though I care deeply for others, feel deep levels of love and other emotions, and I do easily cry and feel joy in reaction to movie scenes or real life stories. Unfortunately, I observe how others take distance from me. I think they interpret me as “too intense”, as I really like to discuss topics in great detail and turn ideas over and run through them with a fine-tooth comb. Also, I find my world very broken and keep looking how to improve it. What’s more, I want others to care about it as much as I do. Once, some friends gathered around a table for a visit, and I began talking about important stuff, like domestic violence. Soon after, my friends shut me out and switched to talking about Botox injections. I felt hurt and irritated. I interpret much of communication of others as superficial and unimportant (like Botox). Reading what I just wrote, sounds funny. But really, I feel alone a lot, even though I make friends easily and I actually like who I am. I love to research and am curious about almost everything! I am very detail-oriented, to the point that I do not get a lot done and work much more slowly than others (at least what is visible to others; they can’t see the volumes in my brain). I always thought that it was my German enculturation (I grew up there until age 12), where quality was valued over quantity. As a child, I spent time playing with close friends, but I also spent many hours alone, lost in my books. I was described as shy in first and second grade but literally grew into being the class clown by end of third grade. I had found my voice. My mother likes to say, “She never shut up and would talk to any stranger.” To this day, I find I can, and will, talk to any person and am interested in learning what they think and feel. This quality has been invaluable in making connections in my work as a massage therapist and nurse, and people easily trust me. I am in school now to become a Family Nurse Practitioner and I plan to open my own private primary care practice. It is important to me to be my own boss and provide the kind of health care that I think makes a difference. This is nearly impossible in the role as an RN. Also, I do not like petty office politics, the drama and noise, and the loss of control I have over how fast I am expected to work. I am a good listener and observe many details in my assessments of my patients, the importance of which, is lost on most of my coworkers. But my patients love how I work with them and they tell me they feel heard and valued. Other clues about me come from the Strengths Finder test I took: it found me to be a strong strategic thinker, a visionary, and able to instill hope in others. It feels good to write all this down. I believe I belong to those identified as HSP, and perhaps, this is explanation of how I can feel so alone at times. Also, I am very straight-forward in my style of communication (because I see that as being authentic and honest), but I know many people have been uncomfortable with this. If I am highly sensitive, how can it be that I just don’t know how to do that “dance around the bush” or “soft-peddle” thing? I don’t think people would label me as “too sensitive” either. As I already said, I do not believe in coincidence. Today, I found your documentary about sensitive people and it resonates with me. I plan to look into this HSP more, and I hope you make your movie about love, Elaine. Thank you for your work and insights! Thank you for others who shared their experiences! I just recently learned about Highly Sensitive People! I thought that it was just a self label, but it’s great to hear that there are tools and resources for them. You should check out this blog (It can be found here: https://wp.me/p9KEij-1w)!! Thank you. I am re-reading your highly sensitive book. I now don’t feel alone or different, there are others like me out there. I look back on my childhood and realized that my grandmother, uncle, and aunt, along with myself are HSP. When I read the comments on this site, I feel as if I have found a community that might understand me. I am an INFP and have found, like others, that I can ‘slow the world down’ by meditating. I am also an artist, by nature and by training, since I was seven years old. I find that it’s difficult for me express myself adequately and effectively as I experience emotion so intensely. I was a red headed child and was called ‘spitfire’ or something similar, by those I trusted enough to express myself fully. In school or in a crowd, I am probably considered shy or ‘strange’. I had a teacher in middle school who said, “Ruthy isn’t so bad, once you get to know her”. I’ve been wondering since then,”What the heck did he mean by that?” My best guess is that he just ‘didn’t get’ me. Thanks for this opportunity to vent. I’ve had some very good psychotherapy, but this venue, I see, is very helpful in it’s own way! My teenage daughter has just been diagnosed with inattentive type ADHD and an anxiety disorder. Information I have found on emotional aspects of ADHD including emotional hyperarousal suggests that there may be considerable overlap between the highly sensitive personality type and the ADHD nervous system. I would be very interested to hear Elaine’s thoughts on this subject. I am wondering the same thing. I have always known my son was a highly sensitive child, however, now I’m questioning the ADHD diagnosis since he was six. Now that he is twelve, and more attentive with less hyperactivity, the HSC issues make much more sense. Thankfully, we homeschool which relieves my son from so many other obstacles plus no need to medicate. As a HSP, I exude compassion more for him than myself. I’m so happy to have found this site, and understanding group! Thank you, Elaine, for all you do! Excuse me for my English couse is not my first language. Ooohhhh! I am this and many more things! I refuse to put labels in myself, others do it for me all my life, and I found myself identified with lots of the behaviour describe here. One that happen to me a lot is : a group of people get together to start something: a business, a meal organization… small or big, after a while I know if that is going to work, to go well or not, and sometimes where to change it. Most of the time is just a feeling. For a long time now I do not say anything anymore, I lived it as a curse because it cost me friends, family and work relationships. I know now that is priceless but I do not share it anymore and I am sad, sometimes, thinking is a waste. I decided to be alone as much time as I can (separated with 2 two teenagers) couse I get into a depression and started to medicated in order to cope with the world. Taking care of myself means to be alone as much as I can. It works so far. I quit the medication already. I started a new love relationship and I started questioning myself, again, all the time. So go into inner silence helps me a lot. I’m a HSP as well as SQ.I spend most of my time with my innerself and trust my innervoice.I’ve trained my brain since childhood not to listen if I don’t think its important. I struggle to relax most of the time.I am a very detailed orientated person.I enjoy the quite during the night. I am an HSP, although never had a label for it until now. I fit into the profile perfectly, though I have know these things for at least a couple of decades. I have employed coping techniques for myself over the years, as a matter of common sense, that are outlined in another article. Unfortunately, knowing that I fit into a category with a name, or sharing discussion with others, makes no difference in what is becoming a more cloistered life for me (i.e., Coping Strategy — Make a deal with yourself that if you try something you don’t like, you don’t have to do it again.) I learned Transcendental Meditation in the 1970s while at college. I did it to cope during my freshman year. I practiced periodically, in spurts. I have tried, very unsuccessfully, to practice diligently once again, but for months have not derived any benefit that I can see. I called my meditations “unsuccessful” because I do not feel relaxed no matter what I try and I cannot calm my active mind. I really don’t know what else to do. I stay at home most of the day because it is the only place I feel (relatively) calm and comfortable. Eric Harrison’s books have been very helpful to me. I found that the terminology of Buddhism was for me a barrier to undersanding meditation. Now I understand and everything I do can be an opportunity to meditate if I wish. What I don’t understand is why everyone seems to consider the noise a bad thing? I’m sure it’s scary but someone told me a while ago that I am a dangerous person when I have an idea. Here’s a crazy one for you. use this skill. be the change! We create our own world as far as I’m concerned. I don’t need a coping mechanism. I am the solution. I am very dangerous. however I choose to use my superpowers for good, to help others. I would like to help people on here too. some of you don’t need it. some might I really don’t know. This is a skill. embrace the chaos and instead of trying to figure yourself out simply trust your instincts and use it to figure out other people. I focus best when my world is crashing down around me. Thats when my survival instincts kick in. I find that complete inner silence is a difficult state to reach and I’ve never had much sucess with conventional types of meditation. My coping strategy involves downtime in the outdoors (country not city) or at sea, where noise and intrusion is less jarring to my HSP brain. Or sometimes I’ll go for a gentle swim and put my mind in neutral. Headphones are pretty handy too, for shutting out the worst of it and letting me focus somewhere inside. This is so fascinating to me, finding all these things that I’ve been doing have a reason – I’ve just thought (and I guess others have too!) that I’m a bit weird! I too want to thank you for your book and work. I read your book over a decade ago, and very much fit the profile of HSP. For the past 3 years I’ve been meditating (as a form of prayer) and it’s become a necessary part of my routine. I’m an introvert, and was very shy as a child with much social anxiety – much of which I’ve worked through. I’m also seeing a therapist, and was dismayed to learn she’s diagnosed me as being a narcissist (a covert one I think). I don’t think this fits as I’ve been told I’m an excellent listener & am highly empathetic. In another website, the author said that HSP are often covert narcissists. Can you address this sometime? As an HSP I’ve found meditation to be very satisfying as a way to find ‘inner peace’, particularly during times of stress. I listen to calming music when meditating, as it helps me find the place in my mind where I can block all thoughts and only be in the ‘here and now’. I’ve sometimes meditated so deeply I’ve been unable to move afterwards! It feels like visiting a little bit of heaven, and I would recommend it for HSP’s as a way of connecting with the feeling of ‘oneness’. Bizarre as this might seem, I’m able to meditate whilst driving (when listening to music). Although meditation is relaxing, I find it actually heightens my awareness, so that I’m very aware of my surroundings and ‘in the moment’. I’ve found this useful for interviews/meetings etc, as I arrive feeling very relaxed but alert. I think being a HSP is a wonderful gift, and that meditation can help us to connect on a higher level. Thank you Elaine for exploring this. I´am not a freak! Thank you for creating this website and opening a new sight for me! for 40 years now I thought I was freak being different, feeling depressed and overwhelmed and seeking silence. Trying Meditation, Shrinks, psychopharmacy and avoiding group gatherings and meeting more than a couple of people at once. Now with my 4year old daughter showing the same tendencies I did I was hoping to find something to not not make her feel outcast like I felt my whole childhood. Please keep this up! I really appreciate your thoughts and your help. I cried feeling so relieved that there are people like me who understand and not reject me, because of how I am! I’m an HSP and introvert… trying to help my 16 year old daughter who I believe is the same. She is struggling to get to school on a regular basis which is so hard since she is so bright, athletic and well liked. I wish I had some tools to help her cope while she is at school. I don’t think that meditation is a viable option for her at school… anything else? She usually watches Netflix at lunch, there is no other escape! Any suggestions would be greatly appreciated! I am a HSP, and it is hard as one when people just don’t understand. For my entire life, I am considered to be very introverted and quiet, which I keep all my feelings inside. Right now, for me, I have so much regrets and hopes loss. I am in a toxic mind right now, need to get out all of my negative thoughts, words, and pictures out. I tend to think and overthink a lot. Which is why I have a huge crisis inside. I am currently on therapy. But, just wanted to say out my story. Please reply for response. If non-HSP brains are different from ours, then that would make sense. A friend of mine once asked me to participate in one of his experiments. He hooked me up to an EEG and asked me to think of as little as possible to scan a baseline of my brain activity before the experiement. He brought in one of his labmates to marvel at how flat my reading was. Apparently I’m good at reducing my brain activity to almost a flat line. It surprised me that that was possible.